The United Arab Emirates (UAE), one of the top friendly countries of Pakistan, has made a fresh announcement for depositing $2 billion in the State Bank of Pakistan’s (SBP) foreign currency reserves in a bid to help Islamabad smoothly overcome international payment pressure. “These funds are expected to be received shortly by the SBP,” the central bank announced on Saturday. The deposits are coming at a very critical time as Islamabad is all set to make a large external debt payment next month while its reserves have remained under pressure, said Arif Habib Limited Head of Research Samiullah Tariq. “Pakistan is scheduled to pay off $1 billion for a maturing Eurobond in April…this will be in addition to some other external debt payments during the month,” he said. 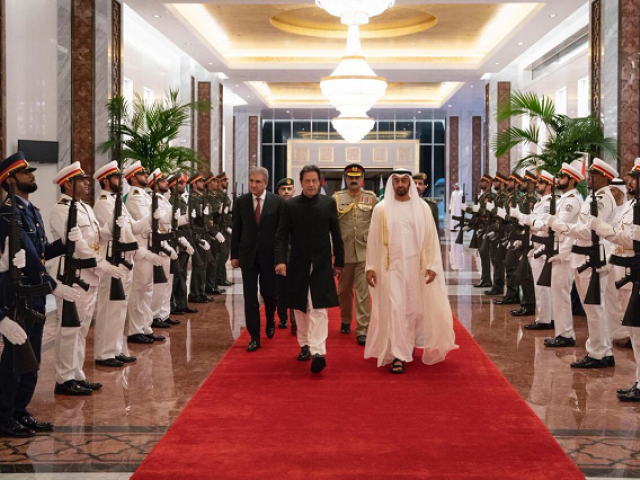 Earlier, the UAE had announced a $6-billion friendly assistance package for Pakistan in December 2018, including $3 billion in cash deposits in SBP’s reserves and a credit line of another $3 billion for the supply of petroleum oil to Islamabad on deferred payment. Abu Dhabi released the first tranche of $1 billion in cash deposit out of the pledged $3 billion in January 2019. “The agreement for the placement of second tranche of $2 billion by the Abu Dhabi Fund for Development (ADFD) with the State Bank of Pakistan has been signed between the two sides – the SBP and ADFD,” the central bank reported. Modalities for the supply of oil on deferred payment are yet to be finalised, it has been learnt. The UAE offered exactly the same bailout package that Saudi Arabia first announced in October 2018 to shore up Pakistan’s foreign currency reserves. Riyadh has already deposited $3 billion in cash in three equal monthly tranches by January 2019. The two countries have also decided the modalities for supply of oil on credit from the current month of March. Besides, China – the all seasons’ friend – has also deposited over $2 billion in recent months. With financial support from friendly countries and through shift in government’s economic policies, the SBP’s foreign currency reserves have remained stable at over $8 billion since late January as these have either slightly moved up or slightly gone down unlike a rapid decline in the past two years. The reserves stood at $8.11 billion as on March 1, 2019, the SBP reported. “Arrival of oil supplies on deferred payment under the Islamic Development Bank’s (IDB) $1.5-billion credit line since February 2019 has helped stabilise the reserves,” Tariq said. An official, who requested anonymity, added that the central bank had been purchasing dollars from retail (open) markets. “The practice has helped maintain reserves flat at over $8 billion since late January,” he said. Earlier, the increased international payment pressure had pushed Pakistan’s foreign currency reserves to almost five-year lows at $6.63 billion as on January 18, 2019. The reserves were insufficient for even two months of imports and dropped due to the widening current account deficit – the gap between the country’s high foreign expenditure (mainly external debt repayment and import payment) and low income (sluggish exports and slightly better remittances). Earlier, the SBP let the rupee depreciate by a massive 32% since December 2017 to encourage exports and worker remittances and discourage imports. Besides, the government has also imposed additional import duties on hundreds of goods. With the assistance packages, Pakistan is believed to have bridged its estimated financing gap of around $12 billion for the current fiscal year 2018-19. However, it will still need around $7-8 billion to finance the current account deficit in the next fiscal year. “So, Pakistan is on the way of acquiring an IMF (International Monetary Fund) bailout as well,” Tariq said. “Islamabad is expected to sign an agreement with the IMF for the loan or at least take some concrete steps in this direction in the next one month and acquire the loan in two to three months,” he said.